One last photo from a walk along the Hudson a few days ago. Not exciting enough? 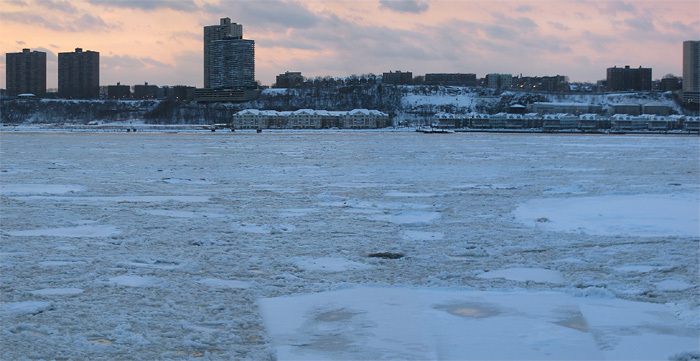 Here's a sixteen second movie (344K QuickTime file) of the flowing ice taken from the end of the pier. There may be fewer entries than normal in the next week. Someone is borrowing my camera (expect a guest posting! ), mass quantities of chili must be prepared today and eaten tomorrow, and it looks to be a really busy week at work. 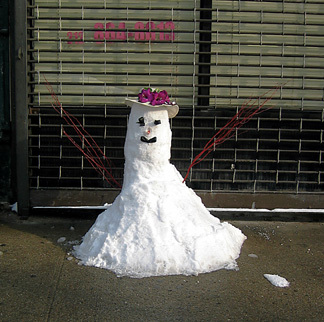 People have been remarking about what a cold, snowy winter it has been in New York City. It has relatively mild compared to where I grew up in Oswego County. I was talking to my Dad, who still lives upstate, a few minutes ago. He said that since Wednesday they've had 69 inches of snow. 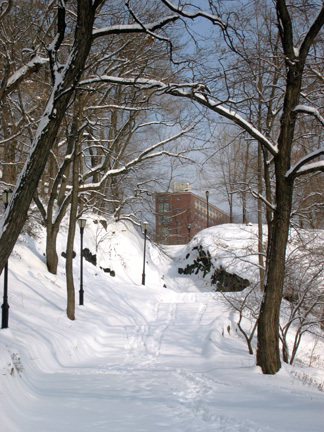 Another 12-18 inches is expected tonight, and another foot during the day tomorrow. It snowed at a rate of 3-4 inches per hour for most of the day today. At one point a foot of snow fell in just ninety minutes. The snowbanks along the streets in the village of Mexico are about 25 feet high. He has had measurable snow for seventeen of the last eighteen days. Mexico is about half-way between Syracuse and Watertown, to the west of I-81 (just to the south of the big green blob in this image). The Storm of January 28-29, 2004: Your Comments and a Photo Gallery - Oswego Daily News - check out the photo gallery! 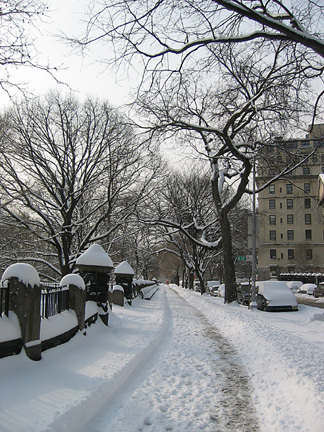 So, ten inches of snow in NYC? Time for a nice long walk along the Hudson. 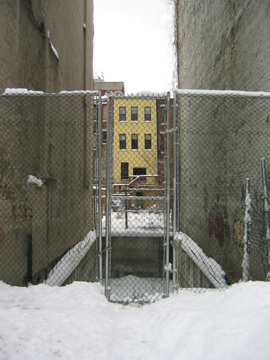 Looking through a vacant lot, 113th St.
Today's theme: Vacancy. The vacant lot is just east of Morningside Park. 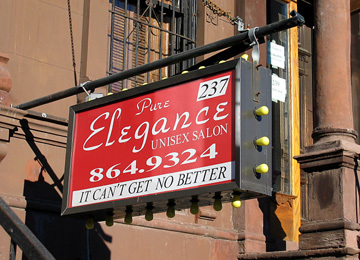 The sign is on a construction trailer at 115th and Lenox. What does it mean? Ruins of a float bridge. 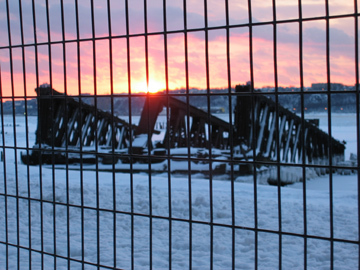 Two views of sunset through Hudson River ruins. near 60th St. This area, where Trump Place is being built, was once a railroad yard. 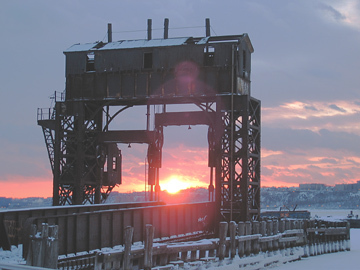 The float bridges were used in the transfer of rail cars to/from barges on the river. 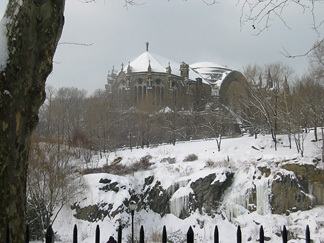 Cathedral Church of St. John the Divine, from Morningside Park. Today turned into an unintentional snow day when I missed the second bus to campus. I was across the street from the bus, waiting for the light to change, when the bus took off. We must have had a different driver today, because I walked up to 120th street to catch the bus when it swung around but it never came. Ah, well, today was a nice day to walk around Morningside Park and share a few photos with everyone. I normally wouldn't write about how I go about picking the photos I post and when I post them, as the process is less interesting than the actual posting. I will say that, since I work on a secluded campus outside the city, I don't have much opportunity for daylight photography during the week. Instead, I take a lot of pictures during my weekend wanderings. Then, on Sunday evenings, I pick a few I like, edit them, add the descriptive text, then upload them to typepad. Typepad allows me to schedule when I want the postings to become public. In that way most of my posting for the week is done on Sunday (although I'll often add more posts during the week, and sometimes I'll remove a posting before it goes public). 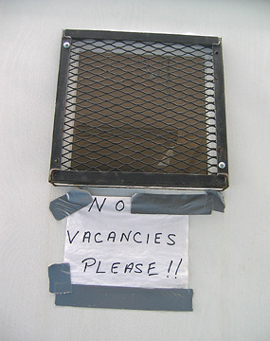 That said, I took this picture of the double negative sign Sunday morning, the same morning I took the photos of Mount Olivet Baptist Church, while walking to the newstand to get the paper. The photo brought back some high school memories that I thought I would share, so I wrote them up Sunday night and scheduled them to appear this morning. I hope you find this as entertaining as I did, especially if you were momentarily confused and thought Tuesday, not Wednesday, was posting of illiterate sign photographs day. In 9th grade Mr. Martin, my English teacher, told us that for every instance we reported of improper grammar or spelling on a public sign or display we would get extra credit points. I remember reading Of Mice and Men and A Tale of Two Cities that semester but I don't remember anyone in our entire class getting any extra credit. In 9th grade we were old enough to realize how small our town was and how few public signs and displays there were. We were disgruntled about the assignment and protested that we never see anything wrong, ever. We thought Mr. Martin's extra credit was impossible to attain. For the rest of my life I will forever be plagued by my extra credit assignment and feel the urge write down a sign misspelling on an index card and bring it in to class the next day. Three snow faces on a Columbus Circle subway station bench this evening. 07:00AM to get the latest delayed opening or closing information. All eyes on winter storm prognosticated to remind US that it does snow in the tri-state region. Model tracks have become more consistent recently...there are still some significant issues which will have an effect on the final snowfall totals across the region. to change to +sn (heavy snow)...and have seen this happen enough times to have some confidence in this idea. A prolonged pl period would cut down on snowfall amounts along the coast...but think pl period will be short enough to not completely wipe out the snow amounts we're figuring on. In English, cold air is moving in from the northwest, moisture is headed our way from the storm developing over the ocean. If the cold air gets here before the Atlantic moisture (assuming that storm gets close enough to us) we'll be blasted with snow tonight. Let's hope so, cold weather without snow is no fun. You can get these tasty morsels at the Sush Bar on Houston St. 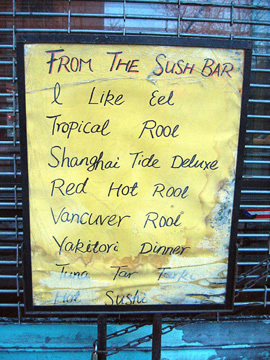 I particularly like the hot sushi and get it nearly every time I visit. When I'm not in the mood for the hot sushi, I go for the red hot rool. I guess what I'm saying is that i really like hot fish. Who doesn't?